Thank you for your support during this difficult time. Please enhance this tribute to Michael by adding your memories and photos. 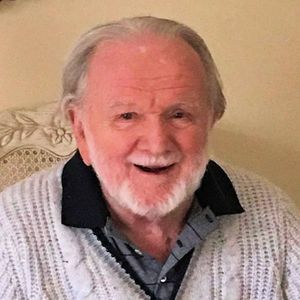 Dr. Michael ("Jack") John McAndrew, Jr., passed away peacefully at the age of 97 at his home in Mount Laurel, New Jersey surrounded by his family on March 11, 2019. Jack was born in Clarksburg, West Virginia on October 14, 1921. The oldest of five siblings, Jack was the son of the late Delia (nee Barranger) and Dr. Michael John McAndrew, Sr.
Jack attended West Virginia University where he was a member of Sigma Chi Fraternity. He graduated during the height of WW II and went right into the Navy where he completed Medical School in three years instead of the usual four. He graduated from Jefferson Medical College in Philadelphia, PA in 1946. After his service in the Navy, Jack went on to Board Certification in Preventive Medicine. He accepted a position at Abbott Laboratories in Chicago, IL in which he directed health services for employees for many years. In 1967, Jack entered The Menninger Foundation in Topeka, KS, where he completed a second residency and Board Certification in Psychiatry. For multiple decades thereafter, he dedicated himself to providing psychiatric services to veterans at the Veterans Administration Hospital in Topeka, KS. Jack was married for 48 years to the late Joan Duffy McAndrew. He was preceded in death by his brothers, Dr. Joseph McAndrew and Dr. James McAndrew; and sister, Maureen McAndrew Allison. Jack is survived by his daughters, Susan Marie McAndrew, Sheryl Anne McAndrew (Daniel Enterline), and Joan Elizabeth McAndrew; sister, Emily McAndrew Koenig; grandchildren, John Karl Schlechtweg, Kathryn Edmonds, Sarah Roch, and Claire Enterline; great-grandchildren, Theodore Roch, Isabelle Roch, and Barrett Moore; and numerous nieces and nephews. An avid golfer, a jazz enthusiast, and a great dancer, Jack was a thoughtful man who loved to read history and science -- especially astrophysics and astronomy. He walked two miles a day well into his nineties. He spent many years living in Avalon, New Jersey where he enjoyed bird watching and supported the work of The Wetlands Institute. Funeral Mass will be said at 11:00 am on Thursday March 21, 2019 at Saint Brendan The Navigator Parish, Maris Stella Church on 50th Street and Dune Drive, Avalon, NJ. Visitation will begin at 10:00 am at the Church. Interment will be at Resurrection Cemetery in Clermont, New Jersey. Memorial flowers are welcome or those who wish may donate in Jack's name to The Wetlands Institute, 1075 Stone Harbor Blvd., Stone Harbor, NJ 08247. Walton and I want to express our condolence on the death of your father Jack. Life Stories provides friends and families a forum to post their favorite stories and memories of Michael J. McAndrew ensuring the precious experiences are never forgotten. Share joyful times, post a photo that captures the moments you cherish, and allow others to reply, relive and remember.